Some of DVT’s trips are geared to entice the most adventurous adrenaline-seeking enthusiasts and some were designed for those who were just looking for a peaceful laidback and un-crowded “real” México experience. For the inquisitive amateur archaeologists and those with a thirst for history, Mike and his Veracruz guides have created tours to visit many of the archaeological zones, historical sites, and interesting museums found throughout Veracruz. DVT even has a multi-day family adventure “togetherness vacation” which was designed with a touch of history and outdoor action adventures which will excite and thrill old and young alike. Believe it or not, in a couple of locations on this trip, there is NO CELL PHONE SERVICE. You can actually be an up-plugged family; at least for a short time. One day excursion tours starting from the cities of Veracruz and Boca del Rio. NEW! – We now help you to custom design trips which include other great destinations to visit in México such as to the states of Puebla, Chiapas, Oaxaca, Michoacán, the Yucatan Peninsula, México City, Jalisco, and Chihuahua to name a few. If you have an interest in creating a México Road Trip where you get to visit many cities and places throughout the country during your vacation; we can help you do that too. Whether your group consists of 2 people or 200, our staff can help you design an itinerary to fit your travel goals complete with transportation, bilingual guides, and accommodations. We specialize in vacation travel to Veracruz! All our host guides are from Veracruz! Company founder, Mike Vondruska along with his local guides, have carefully crafted each trip so you will have the opportunity to experience The Best of Veracruz. Every aspect of each trip has been personally inspected. From the hotel rooms to the local restaurants to the local tour suppliers we work with in Veracruz, we have strived to give you the best of what each area has to offer. 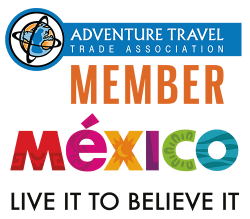 Mike Vondruska, DVT’s office support staff, and our local knowledgeable and fun bilingual tour guides are all dedicated to helping you to create a most enjoyable, memorable, eco-friendly, and adventurous (or laidback) México vacation. All of our English/Spanish guides at Discover Veracruz Tours live in Veracruz. We believe the best way to really take in the “flavor” of this region of México is to have a guide who lives, works, and plays there. Your guide will be intimately familiar with the areas you will visit. They will know the history of the region, the foods you will eat, and even the names of many plants, trees, and the wildlife you may encounter. Depending on your trip itinerary, you may also be led by local specialty guides such as certified scuba instructors, fishing guides, ATV guides, river rafting guides, experts in growing orchids or coffee or vanilla . . . you get the idea. A big plus is that OUR GUIDES ARE FUN! They will treat you like a friend and in no time at all, you will be enjoying each others’ company. Our past travel guests have always given glowing remarks after traveling throughout the state of Veracruz with one of our tour guides. Get the latest Veracruz Trip Updates, Fun & Interesting Stories about Veracruz, & other Helpful México Travel Information.